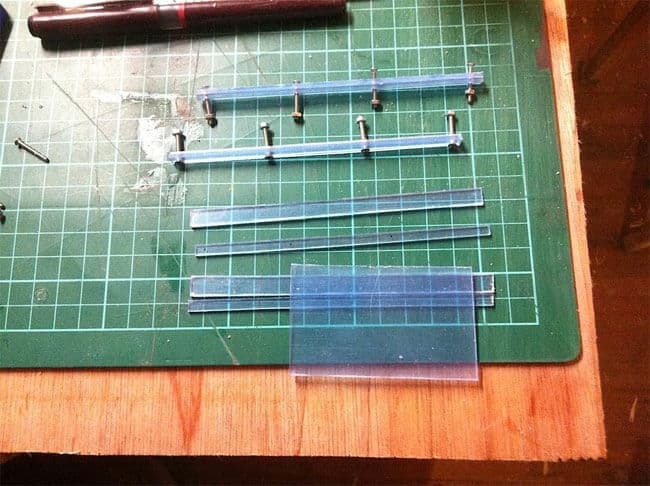 If anyone ever wants to make a set of clear vision panels for a model glider canopy, here is how I did it. 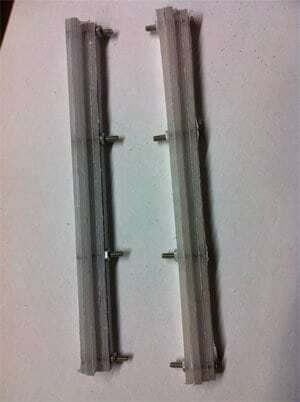 Purchase a small sheet of clear polycarbonate plastic, I used 2mm. One brand name is LEXAN. I bought mine on ebay as an A4 sized sheet, which was perfect. Do not buy perspex or acrylic sheets as they will fracture too easily. Lexan is really quite incredible I made a test rail and bent it double without it breaking, perspex breaks at about 15 degrees of bend. I cut the rails out using an electric scroll saw – this is another very worthwhile investment for a modeller, I use mine on just about every visit to my modelling shed. You will need to make 4 rails per window, 2 inner rails and 2 outer rails. The inner rails need to be smaller than the outer ones to create a recess in which the panel will slide. I made mine 12cm long, inner rails 5mm high, outer rails 7mm high as this suited the scale of the K16. In retrospect the rails could have both been 1mm shorter and this would still work, but things get very fiddly with rails that are very small. I clamped each set of 4 rails together and drilled 4 2mm holes straight through each set – this ensures they line up nicely when you bolt them on. The window panel itself I made 38mm by 60mm. The hole in the canopy needs to line up with the thicker rails so that you have a U shaped box section formed between the canopy, inner rail and outer rail. To make the hole, I offered up the lower rail, used thin blue masking tape to mark the position, measured the rest from that base line, and marked it with more tape. I drilled lots of 2mm holes around the tape, used a dremel with a pointed grinder to join up the holes, and a dremel drum sander to clean up the opening. Again offering the bolted together lower rails to the canopy, i marked the centres of the outer holes with a fibre tip pen, drilled these and bolted the lower rail inside the canopy. I then drilled through the inner holes from inside the canopy using the holes in the rails as guides. Bolted the rail on fully, placed the panel in the hole, and offered up the top rail, repeating the process. 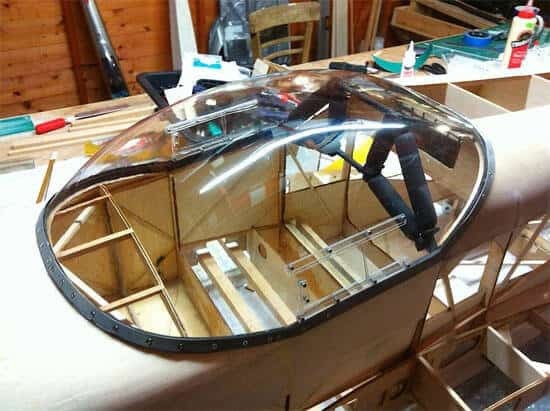 A note when bolting things together – the Lexan is incredibly tough, but the canopy is not. Over-tightening will result in cracking the canopy around the hole, and these will spread slowly outwards like a spider web from the hole – don’t ask me how I know this 🙂 so tighten it gently and use thread locker on the nut.